Executive Producer: David Visser, Story by Darrel Campbell/Pete Maravich, Screenplay by: Darrel Campbell. Produced by Rodney Stone and Darrel Campbell. 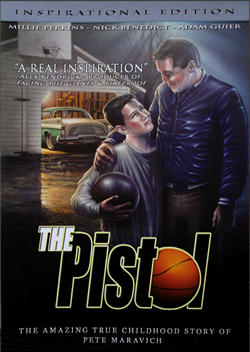 The late "Pistol" Pete Maravich made basketball history as the most spectacular college scorer ever, and he's still inspiring kids through this movie based on his first season of high school varsity basketball (which he played when he was in eighth grade). This 90-minute film explores the supportive father-son relationship that pushed him to the heights of achievement and fame (Dad was a former pro and Clemson University coach) and includes a story line on the stirrings of the quest for racial equality in the late 1950s. Newcomer Adam Guier plays some fine basketball in his role as the young Maravich. Viewers won't be able to track his no-look passes any better than opponents could when the real Maravich was dishing them out. In fact, the basketball sequences in general are superior to many seen in bigger-budget films. 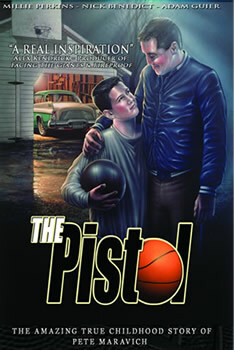 Shot on location in Louisiana, where Maravich grew up, the film captures the moral dilemmas of its time while still keeping a positive drive, making it an excellent film to watch with the kids. The same great movie and extras but so much more! 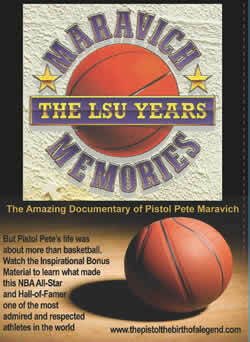 Most people are aware Pete Maravich dedicated his life to God later in life. A few weeks before his death, Pete attended a gathering with Glen Campbell at the home of Jimmie Walker. Pete gives a talk by Jimmie's pool. This Inspirational Edition has bonus features of Pete sharing his journey of faith and talking about his life before Christ. Pete is also asked to spin a basketball on his finger and the show begins! As an added bonus, Dr. James Dobson from Focus on the Family talks to a group of teenagers about the day Pete Maravich died in his arms. Dr. Dobson's son is also in attendance. Very powerful! Pistol Pete Maravich lit up the skies over Louisiana in his meteoric three-year career at LSU and emerged as college basketball's all-time leading scorer with 3,667 points and an incredible 44.2 points per game average. Pistol Pete Maravich was a three-time All American and was named College Basketball's Player of the Year. Pistol Pete Maravich... the name still rings in the ears of basketball fans across America. Who can forget the floppy socks, behind-the-back passes, between-the-legs dribbling, and the wondrous assortment of shots. Now experience the record-breaking career of college basketball's most prolific scorer and greatest star. 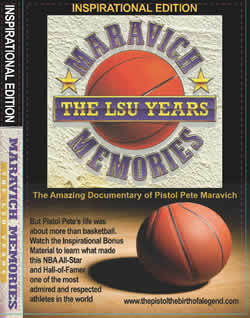 Maravich Memories - The LSU Years is the story of Pistol Pete Maravich through never-before-seen highlight footage, interviews and original music on this collector's edition video.